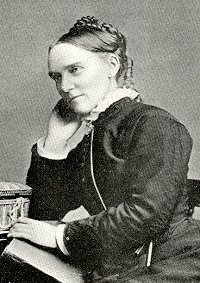 Frances Ridley Havergal (1836-1879) was an unusually gifted and passionate saint. The daughter of a church rector, she was raised in Worcester, England and attended schools in England and Germany. In her love of learning, she grew to become an able scholar (even becoming proficient in both Hebrew and Greek) and a talented singer and pianist. The deepest desire of her heart, however, was in “personal spiritual influence upon others” (Benson). This led her to value most of all her ability to write; for that reason she expended the majority of her life’s labors in writing prose and poetry that would be spiritually beneficial to the saints. Havergal suffered poor health and was taken by the Lord at just 42 years of age. But the Lord prospered her ministry; her writings had a large impact in her own day, and several continue to be read and sung today. In her own words, the hymn is a “consecration hymn” in which the singer commits all of her possessions and being to the Lord for his purposes. It expresses what each of us ought to feel and long for, even if at times we see so much disparity between the words and our actual state that we have to sing most of it in hope and faith. Passion’s album Hymns Ancient and Modern contains a recording by Chris Tomlin that has served to repopularize this hymn today.